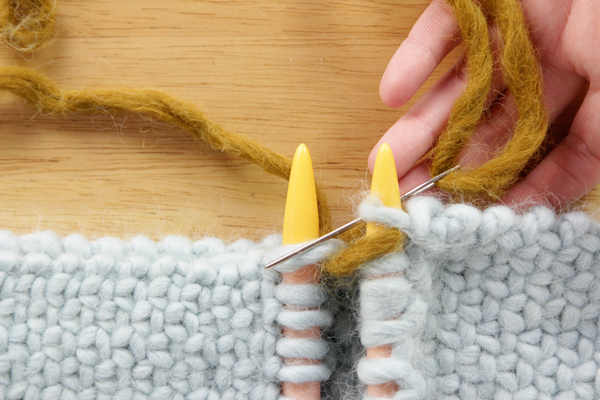 To start, you’ll need to cast on an odd number of stitches with an invisible (a.k.a. provisional) cast on, which I shared last week. 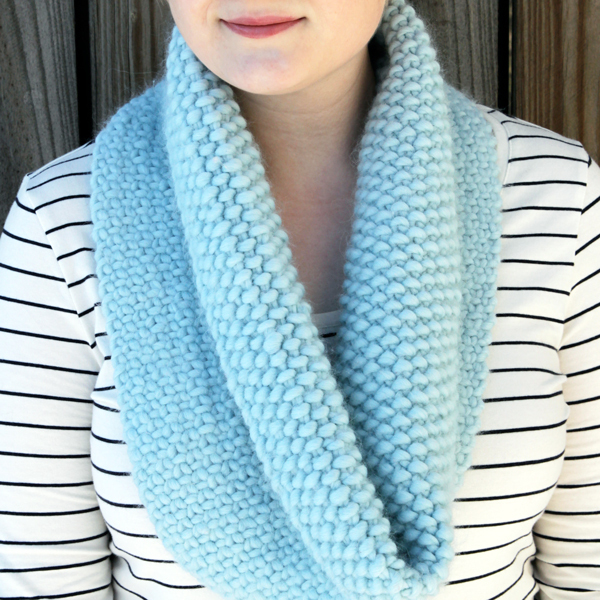 I used 23 stitches for my cowl, but you can do whatever works for you & your yarn. The faux weave effect is super unique, which is partly why I think it’s so beautiful. That also means it’s a little tough to learn from a knitting pattern, so I made a video demoing how to do this. Here ya go! When you’ve knitted the length of your cowl, leaving a couple feet of yarn to work with at the end, you’re ready to attach the two ends of the cowl with a kitchener stitch (a.k.a. grafting). 1. 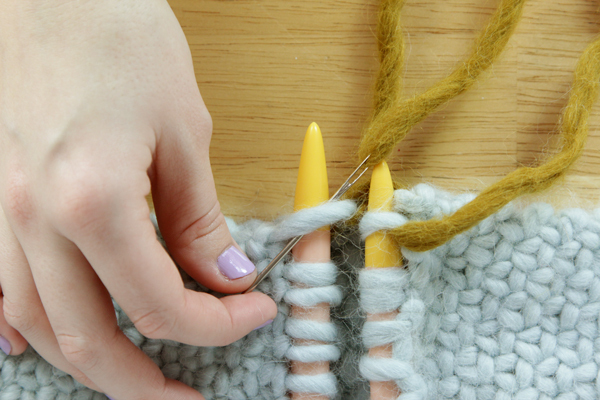 Keep both ends of your knitting on your knitting needles. 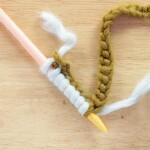 Thread the long tail of your yarn onto a yarn needle. 2. 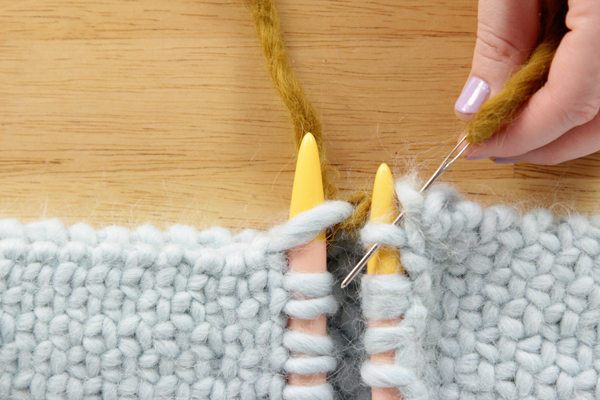 To set up your grafting, hold your knitting needles parallel to each other. Poke your (yarn) needle through the first loop on the needle closest to you purlwise, as shown. Keeping the loop on the needle, pull the yarn tail through. 3. The other part of the setup is to poke your needle through the first loop on the far knitting needle knitwise, also leaving the loop on the needle. Pull the tail through. Now the setup is done. For all the loops from now until the final two loops, you’ll do the following. 4. 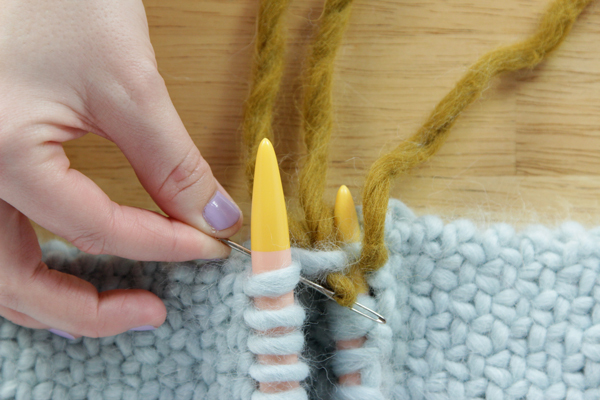 Insert the yarn needle again through the first loop on the closer knitting needle knitwise, slipping it off the end. Sew through the next loop purlwise, pulling the tail through. 5. 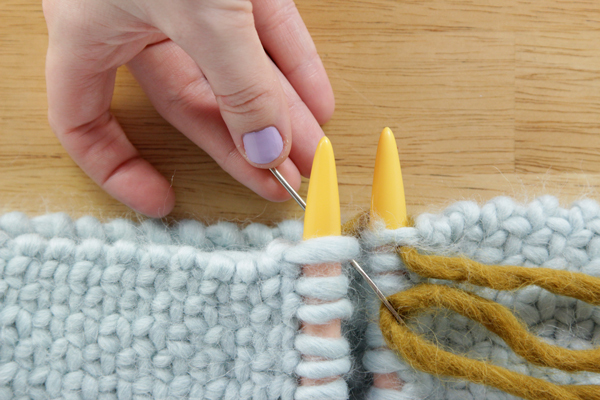 Insert the needle through the first loop on the far knitting needle purlwise, slipping it off the end. Sew through the next loop knitwise, pulling the tail through. The pattern to remember from now until the last two loops is: knit, purl, purl, knit. KPPK. 6. 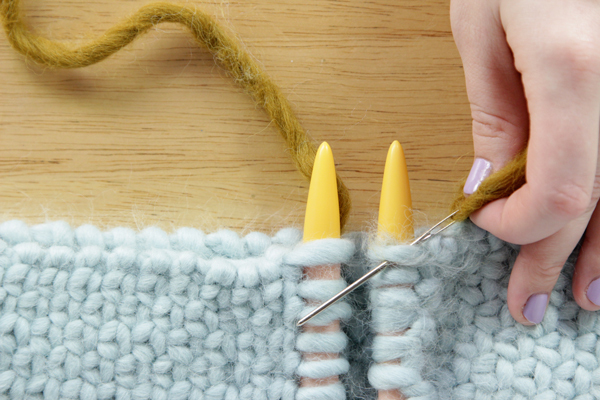 After a few stitches you’ll want to pull on your working yarn to tighten your work. This helps keep the invisible cast on invisible. 7. 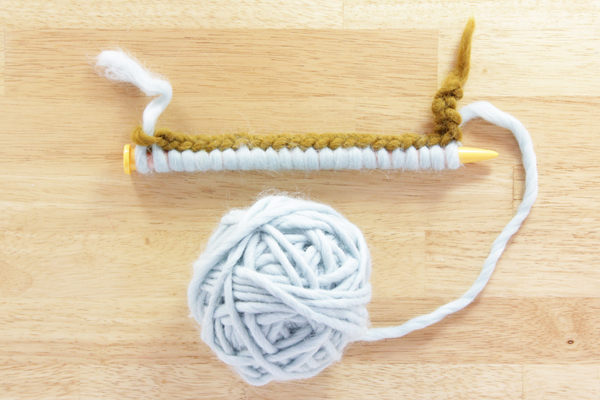 When you find yourself with just one loop on each knitting needle, you’ll finish by repeating steps 2 and 3. Weave in all ends, and trim all tails to finish your cowl. 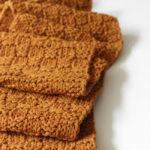 I first learned this knitted faux weaving technique when I knitted my way through Knit Scarves! by Candi Jensen in high school. Knitters, the provisional cast on is pretty great. This is super cute! Thanks for sharing the pattern. I love this cowl. I am going to give this a try after I finish my husbands sweater. TFS the pattern and video!! I marked the needle used for the row to slip purlwise. I didn’t block mine for similar reasons. If you really want to block yours, just make sure to look up the best method for the yarn you used. Years ago when my daughter was a little girl I made her a hat, scarf and mittens using the same stitch. It is easy and very warm. I love that cowl, awesome. I also love your gloves. . . What pattern did you use or is it your own? You caught me, Elaine :). I got those as a gift for the holidays, I threw them on since they matched my glasses so well! Forgive me? Heidi, being fairly new to knitting I have no idea what size needles to use, what is an “appropriate” size? Thanks. Oh, I love the stitch and the color !! And, as I already knitted a cowl with this yarn, I have the right needles ! No excuse ! Love this cowl. I am making one now for a good friend. Can’t wait to make one for myself. Thanks for the nice pattern. I love it !! And thanks for the explanation, especially the video of the stitch ! Moreover, it made me try the provisional cast on and grafting. I’d like to share it on my blog, which is in French. Are you ok, if I just translate the part where you explain the pattern ? For the other instructions, I will redirect to your blog or some video in French. No problem! 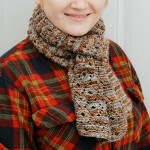 I’ve blogged my take on someone else’s pattern before (here’s how I formatted it: http://www.handsoccupied.com/2013/12/lovely-lacey-scarf/ – I didn’t paste her charts or the pattern into my post since I didn’t write it). If you could refer your readers to this post for the pattern in English, that would be great. Thanks so much for asking ahead of time! :) You’re the best. And then came the grafting. I didn’t follow it well the 1st time & had to repeat, but then I realized it was the same way my mum had taught me to join it (but for the leaving it on the needles) and as it was a bit loose I pulled the yarn. Once at the end. I realizad the loose thread was from the last row not the grafting so I ended up with 3 threads to hide thru the stitches. And now is 25ºC here in Alcalá de Henares so it’ll be a while before I try its warmth. Thank you for this pattern! (And for tips on working it in the round) I just started it last night and it’s knitting up like a dream! 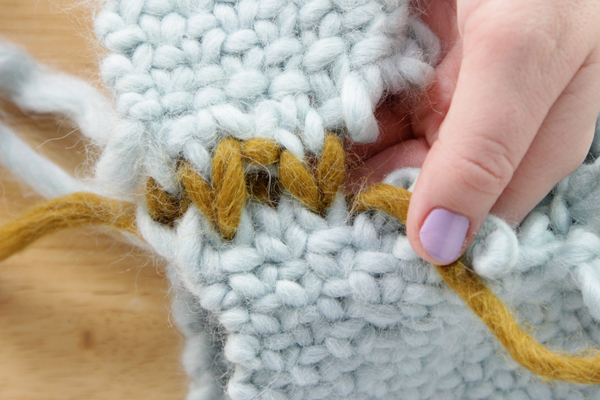 I LOVE the texture of this stitch! 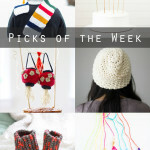 I would like to knit a hat using the same pattern. Is this stitch particularly stretchy? 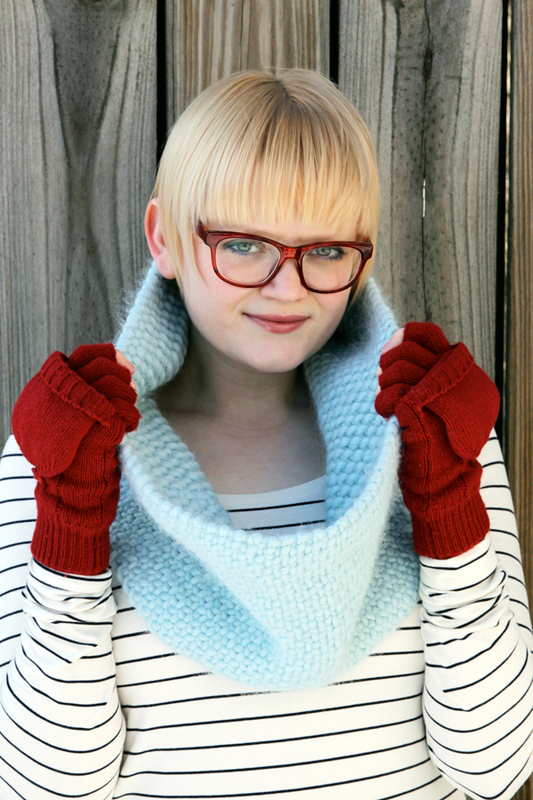 Have you used for something other than a cowl before? Would you please show me your (A.K.A.) Provisional Cast On again. Here you go, Edith: provisional cast on tutorial.